July 2018: I am humbled to be feature as 1 of the 10 greatest African female Trailblazer athletes. Follow the link to learn more. This month marks 6 years since my historic appointment as the Zimbabwe-European Union Honorary Ambassador for Gender ,Youth ,Sports and development and l think it made me the Youngest Ambassador in the World. Since l was young it was always my desire to help others at school my friends gave me a Nick name Mother Theresa and laughed a lot about it until l was appointed by the EUROPEAN UNION Delegation to Zimbabwe and realised it's a calling. I have since adopted an orphanage in Warren Park called Nyarirai Children's Home which l help with my pocket money and sometime my prize money. My parents help a lot in looking for books clothes and amenities for the children. Every year I've been organizing with my family and friends of #TeamTanya a Christmas party for the kids celebrating together . Just recently l received a request from Voice of Grace about a campaign to help a kid to go to school. The information is on the flyer on the pictures l posted below. July 4th, 2018: Thank you Malala to showcase my story! Great weekend special l was invited as a guest to a Family Fun and Sports day by the First lady of Zimbabwe Amai Mnagagwa. It's always my pleasure to mix and mingle with my home fans of Mabvuku. I spent the whole day in the suburb of Mabvuku township,this is the township which is home to my favourite hunting ground Doonybrooke Race Way where l do Motocross. It was a special day most fans don't have access to meet and mingle at the track because of paddock positions,but on Saturday we had time to mix and take photos. Harare, Zimbabwe March 8th, 2018 - In just a couple more days I will be live on the BBC Channel. I love to be able to tell my story and inspire other kids in Africa and world wide. Mark your calander and let me know what you think about the documentary! Thanks to everyone that made this possible! I can't wait to use those new Helmets!! Harare Zimbabwe, March 28th 2016 - Behind the scene with Wizzy, of The Wizzy's Lounge. I was asked to be her talk show guest for episode #10. What an amazing experience! The show will air on Mnet and Zambezi Magic. It's mostly about success Zimbabwean stories with inspirational outcome. Harare, Zimbabwe, February 23rd 2016 - It was an humbled experience to be invited to talk at the TechWomen conference in Harare, Zimbabwe. Thank you for giving me a chance to explain what motocross is doing for my life. Harare, Zimbabwe, February 20th 2016 - I am very excited to be asked to be a speaker at the Techwomen Zimbabwe and connect with the Women in STEM from Silicon Valley! Harare, Zimbabwe February 1st 2016: I would like to thank zimcelebrities.com for acknowledging the youth on this special article on Zimbabwe's most Influential teenagers. Harare, Zimbabwe January 16th, 2016 - SNEAK PEAK: behind the scene with BBC World TV journalist, Mr. Mukoma. Look for a feature on me on early February! I'm very happy that BBC is going to tell my story worldwide. Harare, Zimbabwe, December 16th, 2015 - At the Annual National Sports Awards (ANSA 2015). This is probably one of the days i will not forget in 2015, when i walked away with 2 Gold Awards, namely the Junior Sports woman of the Year Award and Junior Sports Person of the Year Award. It was very motivating and it made all the hardwork and effort worth it. I look forward to 2016, as i begin my world tour and continue to believe that with hard work and determination anyone can achieve their goals. Harare, Zimbabwe, December 6th 2015 - Poster child!! I'm happy to announce a collaboration with Dominion Innovative Créations for the Harare Children's hospital. I was chosen to potray and inspire the image of "Thrive Beyond illness" for the sick children and the community at large. This opportunity will bring more visibility to both the hospital and Team Tanya within our community and internationaly. To begin the 2016 campaign we will be hosting a fundraising Christmas Dinner to engage the community before year end. The funds raised will go towards a Christmas brunch which will be held at the Children's hospital to support the pediatric patient population admitted on December 25 ,2015. Harare, Zimbabwe, November 28th, 2015 - I'm happy to communicate that I have made the shortlist for the ANSA Sports Woman of the Year. I am very fortunate to have so much support from so many people in my country. I will work hard to make everyone proud. You can read the article published on The Harald, here. Harare, Zimbabwe, October 10th 2015 - Just few days after my return home I was invited to Zifm studios in Harare for a radio interview. I had a great time telling my story and my experience in the UK to my fellow country men and women. Harare, Zimbabwe October 7th, 2015 - This is the moment I landed back in my home country as 2015 Sports Woman of the Year. I can't even start to describe the joy of see so many people welcoming back. I'm a girl from Africa with a dream. Taking it all in! Thank you everyone for the support! Birmingham, UK - October 3rd 2015 - This was another amazing stepping stone in my mission. On October 3rd I was nominated 2015 Sport Woman of the Year in Zimbabwe. The ceremony was amazing and it was my first time traveling to Europe. I can't wait to be back and race there. Thank you everyone that voted for me. I will make this dream come through and inspire other african girls along the way. Harare, August 31st 2015 - What a great experience to participate in the FIM Motocross of African Nations event this past weekend at DonnyBrooke. The women class was composed by 3 South Africans, 5 Zambians and 3 Zimbabweans. We all race together with different bikes size. I entered the race on a 85cc (smallest bike in the class) and ended up with 7th overall. Thank you everyone for the support! Harare, August 25th 2015 - In less than a week I will be racing for Zimbabwe in the African Motocross of Nations. I can't wait to finally race against the best women motocross riders in Africa. I will be proud to represent my country. Follow me on Twitter, Facebook and Instagram for weekend updates! Voting will close on September 20th, 2015. Please share! Harare July 1st 2015 - After many difficulties we finally were able to receive my desired Bell Moto 9! Thank you to everyone that move mountains to make this happening for me! I'm very happy to have a new helmet that is top of the line. Safety is the #1 priority in racing! Harare June 16th 2015 - Another amazing race at Donnybrooke! I keep having my eyes on the target, practice and racing will help me get closer to my ultimate goal to race in the USA one day! Thank you all for the continuos support! Harare, March 23rd, 2015 - The new #‎British Ambassador in #‎Zimbabwe #‎Africa celebrated success stories in Zimbabwean #‎Sports discipline, Sunday March 22nd. Tanya: "I'm humbled to have been invited along those succesfull athletes. I will continue to do my best and inspire the #‎youth to believe in your dreams. Thank you everyone that attended to cheering me on". Harare March 16th, 2015 - Second race of the year for Tanya at the Bogwheelers Club Championship held at #‎Donnybrooke #‎Harare #‎Zimbabwe circuit. Tanya finished second overall in the 65A class. "What a memorable race with a first in the last Moto. 4-2-1 finishes gave me second overall. I dedicate the race and the trophy to all the Girls and women on this earth that inspire the youth Thanks to all my sponsors for the continuos support. @axoracing @bell_powersports @vurbmoto @vonzipper @dvsshoes @armoredgraphixinc @stefybau @andybell @campsgram @eucouncil "
Harare, January 27th 2015 - It has been a little bit since the last update and a lot of positive things has happened in Tanya's world. The 2015 Summer Series (December 10th - 14th) was another unforgettable event. This event is comparable to how the Mini O's are run in the USA, with 2 Supercross main events and a Motocross race. Tanya was poisoned to better her previous year results where she finished 2nd overall. Her week of racing started very good, with a second in the Supercross race one. In the second Supercross race, unfortunately, a little bit of bad luck struck (broken chain in one of the main event) resulting in DNF. Tanya was ready for revenge and she won the last event of the week granting her the 3rd step of the podium overall. 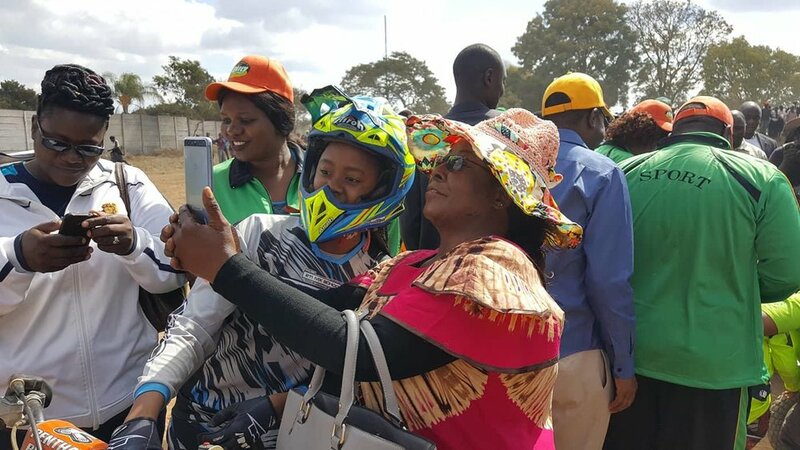 She was very happy to compete with her new bike, a 2014 KTM 65cc donated by the EU Delegation in Zimbabwe, and took every hole shot in all the motos she competed in. With the racing season completed and the end of the year fast approaching, Tanya received another honorable recognition. The country of Zimbabwe nominated Tanya as the most influential kid of the nation for 2014. This is an outstanding accomplishment considering that she choose to use the sport of motocross in Africa to persevere and become an example for many other kids. Her younger sister Alicia, is now following Tanya's foot steps and started to ride Tanya's first bike, a Honda XR 50. I have met Alicia before and I can already tell that Tanya will have her hands full in the very near future! Last but not least, Tanya was recently invited as a guest to participate at the National Radio show on Sports FM along side DJ Butler Nhepure. On behalf of Team Tanya, thanks to all the sponsors and people for the continuous support! Until next time! Donnybrooke, Harare December 9th, 2014 - Tanya participated in the first race of the Summer Series today and scored a very impressive 2nd overall in Supercross event. Tonight race marked the first of the 3 races that make up the Summer Series. She raced in the 65B class against boys from South Africa, Zambia, Zimbabwe and Botswana. Stay tuned for more exciting news for round 2 and 3 of the Summer Series! Harare, October 13th - Hello Everyone! Here some news about #TeamTanya from Zimbabwe, Africa. After receiving her brand new KTM 65cc from the EU Delegation Tanya went to work to learn the new bike and go back into her training program. In September she competed in a Flat Track event at the DonnyBrooke facility in Harare finishing an outstanding second overall in the 65cc class but the biggest challenge came this past weekend, October 12th when she entered the 3rd race of the Zimbabwean Motocross championship, held once again at the Donny Brooke track. Tanya was nervous since this event marked her return to motocross racing after a long pause due to the inability of her family to provide funds to bring her to the races. Tanya was excited to finally race again and her talent shined once more in the 2 moto format. In the highly competitive 65A class Tanya finished 5th overall among a rooster of 15 very motivated boys. Tanya will continue her training in the coming months and she is poisoned to better her results before the biggest event of the Season, the Zimbabwe Summer Series which is set to take place in December. Follow Tanya on Facebook, Twitter and Instagram to show your support by tagging #TEAMTANYA. Go Tanya! Harare, August 19th. - Today was an important day for Tanya Muzinda and the sport of motocross. Tanya was elected the Zimbabwean Honorary Ambassador for Gender, Youth and Sport by the EU Ambassador Aldo Dell’Ariccia during a very elegant ceremony, held at the DonnyBrook Motorsport park just outside Harare. A large number of guests of honor, including the country’s Vice President, the Ambassador of China and the Ambassador or France, were among the political figures that attended the event. Tanya was called to the stage to speak about her dream of becoming an international motocross racer and her desire to inspire everyone in believing in their dreams. Then she took it to the track for a little demonstration of her talent. During the ceremony Tanya was gifted a brand new KTM 65cc offered by the EU, a little token of appreciation for what she is already doing for her country and the young generation. #TeamTanya is starting to gain attention also outside Zimbabwe and a number of technical sponsors have already embraced the project. However more funds are needed for her to receive products from all over the world and to generate the budget necessary for her to go training and racing. Follow Tanya on her social networks (Facebook, Twitter and Instagram at /TanyaMuzinda). July 30th 2014: Today I was a guest to the Radio Show, Live at Five on Power FM in Harare #Zimbabwe with DJ Official Chilli. It was a great experience and thank you everyone to have called in to learn more about #TEAMTANYA Project. This help my motivation to turn my dream into reality. Thank you ArmoredGraphix for the support on the stickers! June 15th 2014, Maggiora Italy - Thank you Antonio Cairoli for supporting my dream! June 2014, Harare - Thank you Armored Graphix to provide me with this cool set of graphics for my new bike! Thanks to all my sponsors for the support!